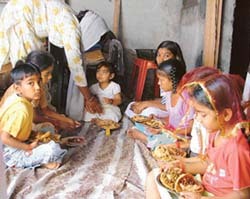 pre-pubescent girls for the Kanjak ritual. Two main farmers’ organisations of Punjab — the Bhartiya Kisan Union (Lakhowal) and the Bhartiya Kisan Union (Rajewal) — are likely to merge together after 18 years of their split. The two organisations have already announced a joint programme to protest against the wheat import in the country from April 10 by boycotting government mandis. The district unit of the CPI staged a dharna in front of the Mini-Secretariat here today. The CPI condemned government’s failure to control rise in prices of essential commodities and essential services. Thousand of activists from different parts of the district participated in the dharna. The drug smuggling has become so profitable in the city that smugglers were bringing booty at cheap rates from Nepal. Eight farmers were injured when an autorickshaw in which they were traveling collided with a truck at Jhabewal village, near Samrala, today. The farmers were coming to Ludhiana to participate in a dharna to be staged in front of the Deputy Commissioner’s office. 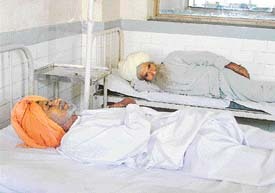 Two of the farmers, who were injured in a mishap, in a hospital. 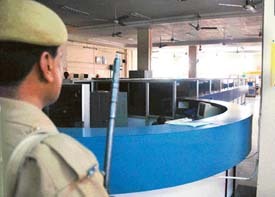 Business to the tune of crores of rupees was effected and customers kept complaining as the strike by State Bank of India (SBI) employees continued on the third day today. Not only did business transactions come to a halt, but pensioners, salaried employees and government departments too suffered as a result. ''A phobia is basically a fear. We all have fears about things such as heights and spiders. But, for most of us, they do not interfere with the way we lead our lives. These fears are only called phobias when they interfere with things we would otherwise enjoy or do easily. The usage of shunt capacitors by farmers alone would result in an annual saving to the tune of Rs 55 crore on transmission and distribution losses in the state. Even as the installation of capacitors is must while taking a new connection, the number of farmers who have installed the capacitors is negligible. Leaders of Congress party disbursed grants worth Rs 554 lakh for the development of 82 villages falling under the Kilaraipur Assembly segment of Ludhiana district, a stronghold of the SAD, at a rally organised at Latala village today. 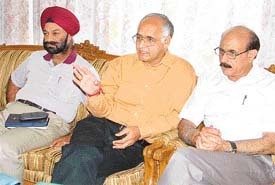 The Punjabi Writers Association of Rampur organised a story recitation function at the library of the sabha. 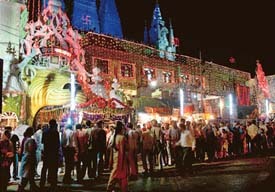 Ved Prachar Mandal celebrated Ram Navami in SD Secondary School, Haridev temple here today. The chief organisers were Mr Roshan Lal Arya, secretary-general of the mandal and principal of the school, Ms Asha Chopra. The Punjab Pradesh Congress Committee secretary and director of Punjab Pollution Control Board, Mr Ramesh Joshi, has congratulated Mrs Sonia Gandhi for setting up a tradition by quitting her seat in the Lok Sabha. A woman was badly injured when she was allegedly attacked by her husband who was under the influence of liquor here late last night. 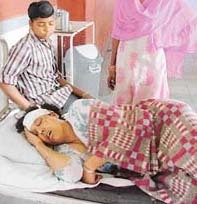 The woman, Balwinder Kaur was rushed to the Civil Hospital. Doctors said that there were multiple injuries on her as her husband attacked her repeatedly with a sharp-edged weapon. They added that her condition was critical. Police sources said that her husband had allegedly hurt her in a fit of rage. Hutch today announced the launch of a ‘mobile Hutch shop’ with a view to provide convenience and online customer service to Punjab’s rural subscribers at their doorstep. The company said that the shop would travel to Derabassi, Zirakpur, Ropar, Fatehgarh Sahib, Sirhind, Khanna, Samrala, Kurali and Kharar on a weekly basis. To infuse the latest style and grandeur to conventional weddings of Ludhiana, Sunstar Expositions Pvt Ltd, New Delhi, will organise a mega wedding exhibition under the name “Wedding in Style 2006”, first of its kind to be held in the city at Hotel Maharaja Regency from April 7 to 10. Perturbed over the Union Government’s decision to import 20 lakh tonnes of wheat at the time when fresh crop had already started arriving in the mandies in the North, the Bhartiya Kisan Union (BKU) has threatened to boycott the grain markets and block procurement operations if the government went ahead with the decision. The Desh Bhagat Institute of Management & computer Sciences, Amloh Road, organised a one-day workshop on application of human values and effective methods in teaching profession here yesterday. A national level conference on ICT enabled teacher education was held at the BCM College of Education here yesterday. The conference aimed to serve as a forum for various stakeholders to discuss the role of ICT (information communication technology) skills among the teachers. Students of LCET, Katani Kalan, brought laurels to the college by performing at “Utkansh-06” — a national-level cultural meet organised at Dr B.R. Ambedkar National Institute, Jalandhar. In order to ensure transparency in the recruitment of teachers, the state government has decided to display the list of all the applicants along with the educational and other qualifications in the Zila Parishad offices. The Punjab Agricultural University Academic Council has decided to introduce the system of re-evaluation in the external examination and the students may apply for the same after paying the prescribed fee. A lecture on “Agricultural and industrial applications of plant cell wall synthesis” was organised at the Punjab Agricultural University on Tuesday under the auspices of the PAU Science Club — a forum for scientific discussions. Inspired by the call for moving towards villages under the National Rural Health Mission, launched by the Government of India, medical teams from Christian Medical College and Hospital and SPS Apollo Hospitals here organised a week-long free medical camp at Shug Bhatoli village in Kangra district of Himachal Pradesh. The stage is set for the immunisation against polio of over five lakh children in the age group of 0-5 in the district on April 9.